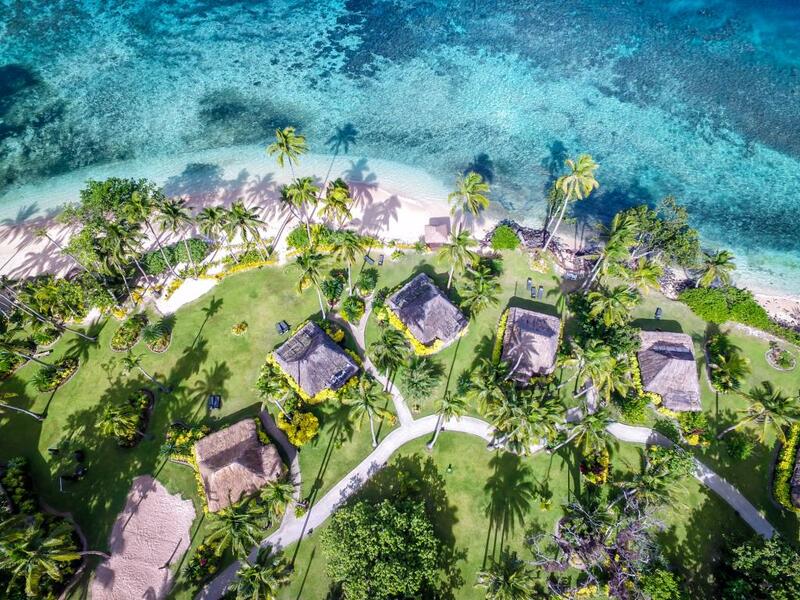 Qamea Resort & Spa is a luxury adults only couples resort on the Island of Taveuni, which is a 90 minute flight from Nadi Airport. 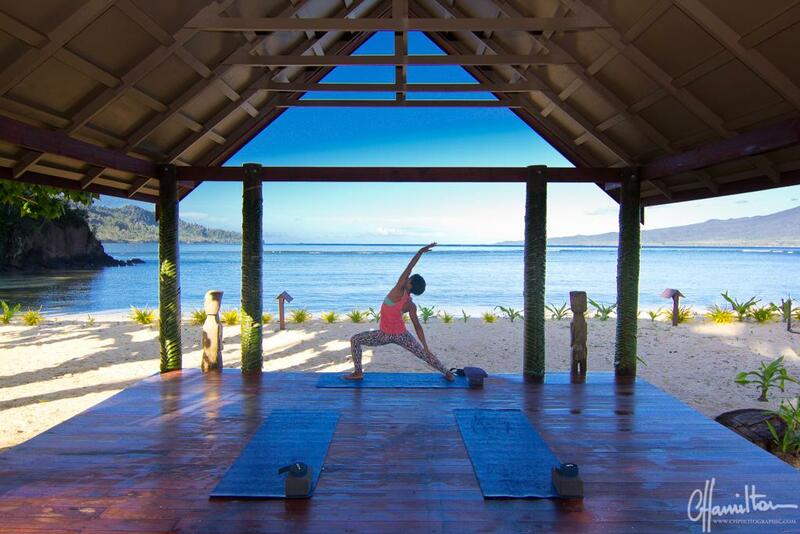 This intimate Fiji accommodation is situated on 100 Acres of private tropical land on a stunning beachfront and welcomes a limited number of guests at a time to ensure privacy and serenity. Most accommodation is beachfront and has a romantic feel with outdoor river stone showers and four poster canopy beds in each bure. 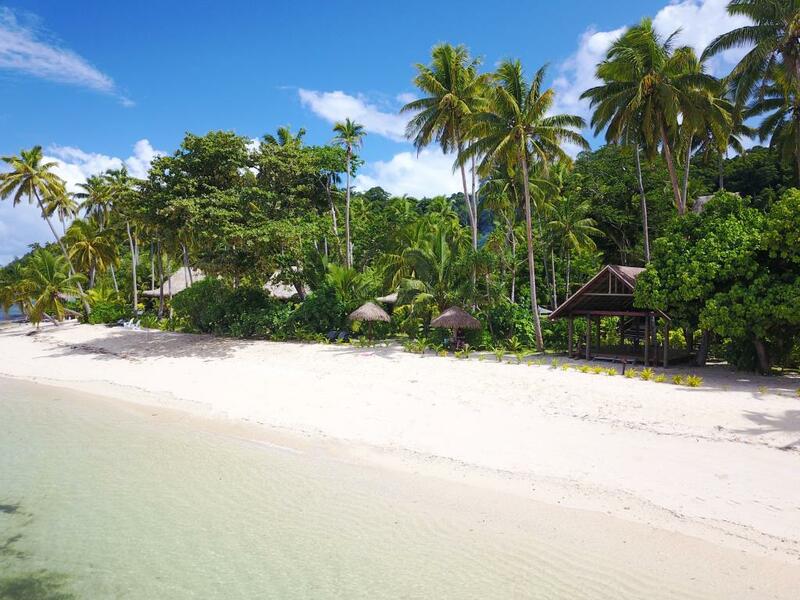 The entire resort fronts onto a private white sand beach over a kilometre in length, and is known as the most spectacular beach in Fiji's northern island group. 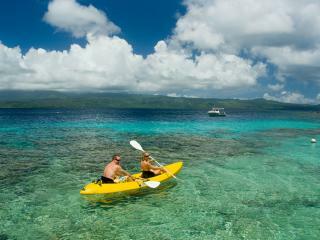 The reef just off from the resort has been named as one of the top ten resort snorkel reefs in the world. 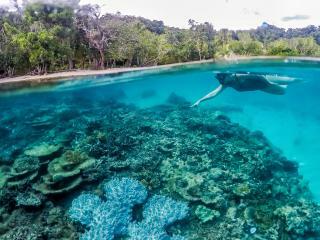 This is a great place to get acquainted with snorkelling and experience some incredible fish life on the famous Piano Reef. 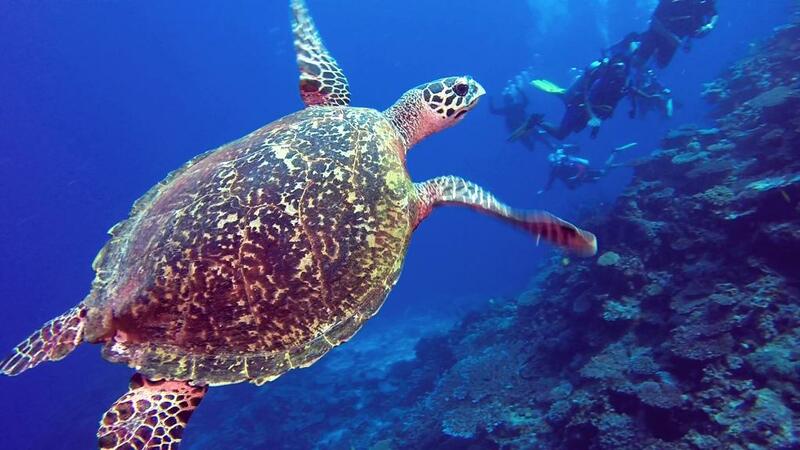 If you would prefer to Scuba Dive the resort operates two to three dive trips per day. 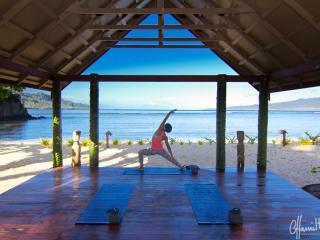 Other activites range from catered picnic lunches at jungle waterfalls or private beaches to invigorating coastal walks or mountain hikes. 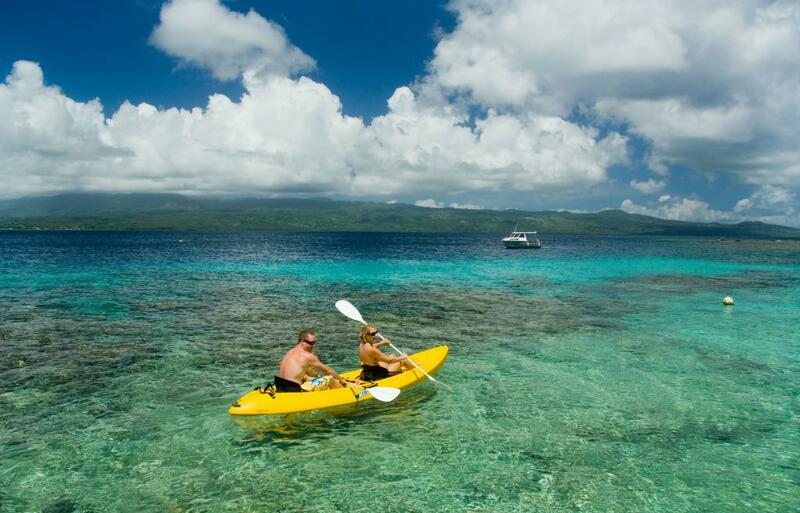 Enjoy sea kayaking, hobie cat sailing and windsurfing complimentary at the resort. 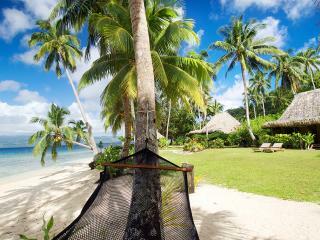 Qamea Resort & Spa also features a jungle pool and Jungle Spa to relax in. 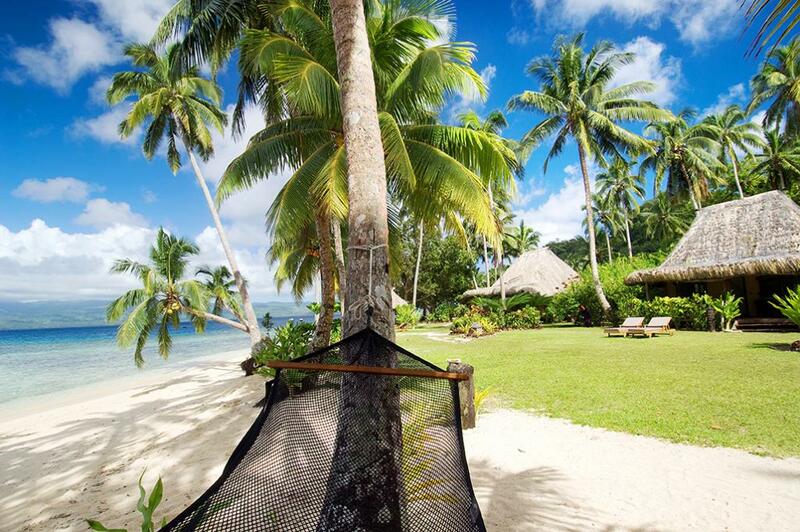 Qamea Resort & Spa has seventeen luxuriously appointed and air-conditioned Oceanview and Beachfront Bures and stunning villas with private pools, nestled among swaying coconut palms and tropical gardens. 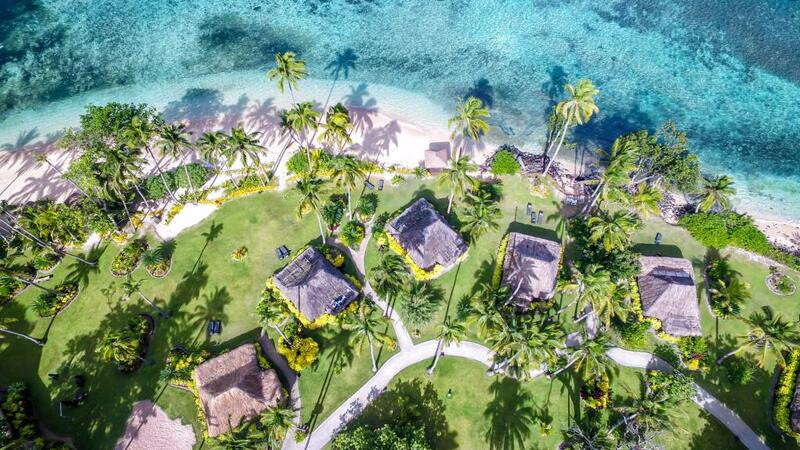 Beachfront Bure: are 65 square meters, have thatched roofs and were hand designed and built in a traditional Fijian style, with high 20 foot ceilings and hand polished local mahogany hardwood floors offer a true Fijian experience. Bures are positioned for maximum privacy. Beds are four poster canopy beds. Beachfront Bures features an outdoor rock shower. Bedding is 1 King bed and 1 Single Bed. Maximum room capacity is 3 Adults. 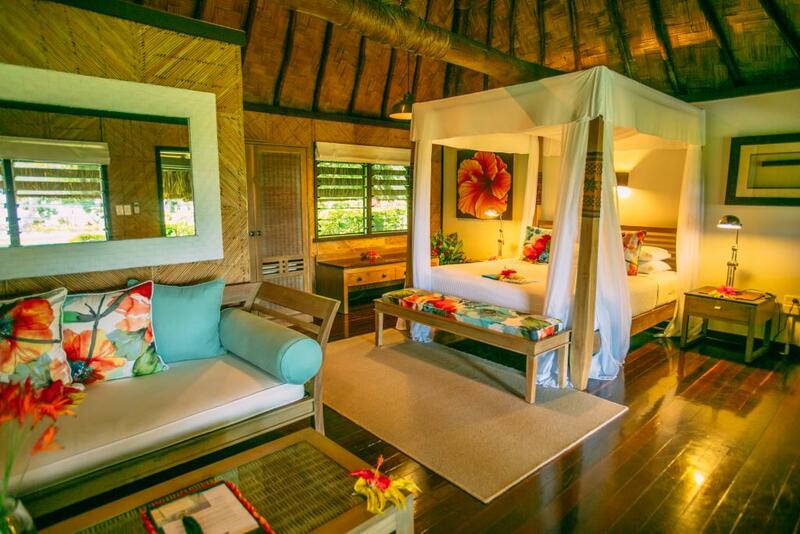 Honeymoon Bure: With over 85 square meters, the honeymoon bure has unobstructed views of Qamea's lagoon and beautiful beach. 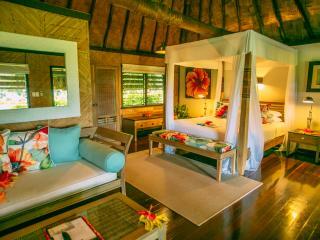 The bure has an outdoor courtyard with natural stone Jacuzzi spa pool and outdoor river stone shower. 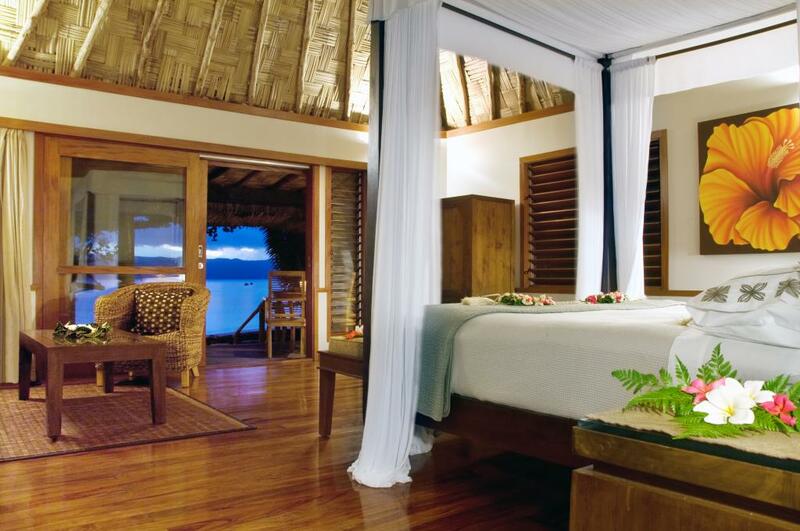 Another unique feature of the Honeymoon Bure is a covered day bed off the beachside deck with privacy curtains. Bedding is 1 King Bed and 1 Single Bed. Maximum room capacity 2 adults. 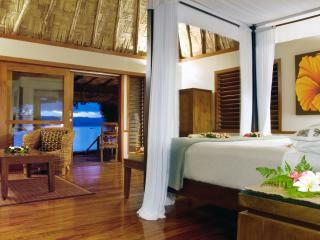 Royal Beach House: 150 square meters of luxurious beach house. Set at the opposite end of the resort's long white sand beach, these beach houses have absolute privacy, and command excellent ocean and beach views. The beach houses have their own private swimming pool facing the beach, a large daybed on the covered deck in addition to outdoor furniture, and an outdoor shower. Inside there is a separate living room, raised platform bedroom area with romantic 4 poster canopy bed, and a large bathroom with double sinks, walk in closet, and indoor shower. The beach houses also have the latest available electronics, including TVs and iPod docking stations. Bedding is 1 King Bed and 2 Single Beds. Maximum room capacity is 5 Adults. Royal Villa: Located on the most private end of the Resort and set on the white sand beach, the Royal Villa commands stunning views. Total room size is 150 square metres featuring 2 full bathrooms, a master king bedroom with ensuite and indoor shower, 2nd bedroom and a shared bathroom with outdoor shower. Also has a living space equipped with a 42” plasma TV connected to international satellite, DVD player, stereo with an i-Pod docking station and telephone. The Royal Villa has its own private plunge pool and heated Jacuzzi spa, is fully air conditioned, fan cooled, mahogany hardwood floors, soaring ceilings, and a large deck with outdoor furniture and hammock.. Bedding is 1 King Bed and 2 Single Beds. Maximum room capacity is 5 Adults. 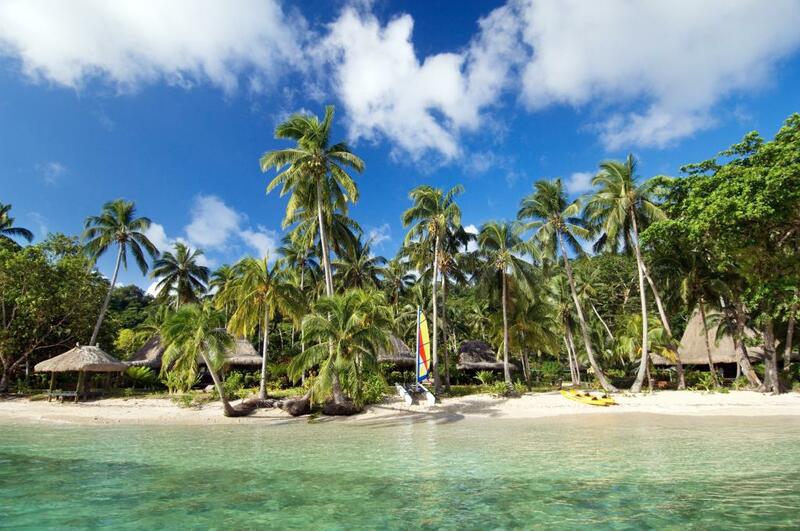 Qamea's resort manager Tracey Purcell is a qualified chef and also has a team of five full time Fijian chefs that together have over 100 years of cooking experience. 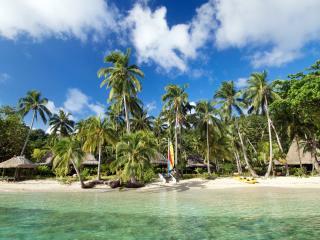 The resorts cuisine can be described as South Pacific Rim, which is similar to California cuisine. The fruit and vegetables are organic and what doesn't come from Qamea's own gardens is flown in from New Zealand 3 times a week. All of the seafood is caught fresh locally and beef and poultry is flown in from Australia and New Zealand. Qamea has a full bar service, with a new tempetature controlled wine cellar, and ever growing selection of Australia, New Zealand and California wines. 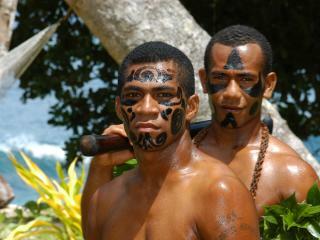 Qamea is widely know throughout Fiji for its excellent food. Guests will not be disappointed. 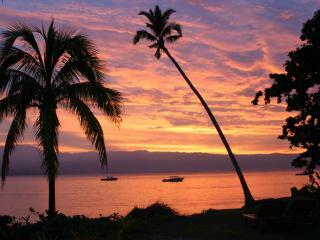 Qamea has some of the world's premier dive sites, located just off the beach and nearby Taveuni Island. Qamea's fully PADI accredited dive operation features such world class dive sites as the Purple Wall, Qamea Freeway and plenty more. 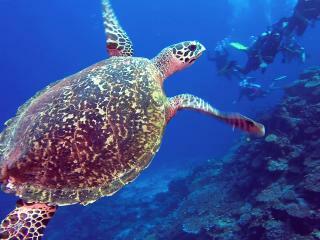 Most dive sites are within 10 minutes from the beach. 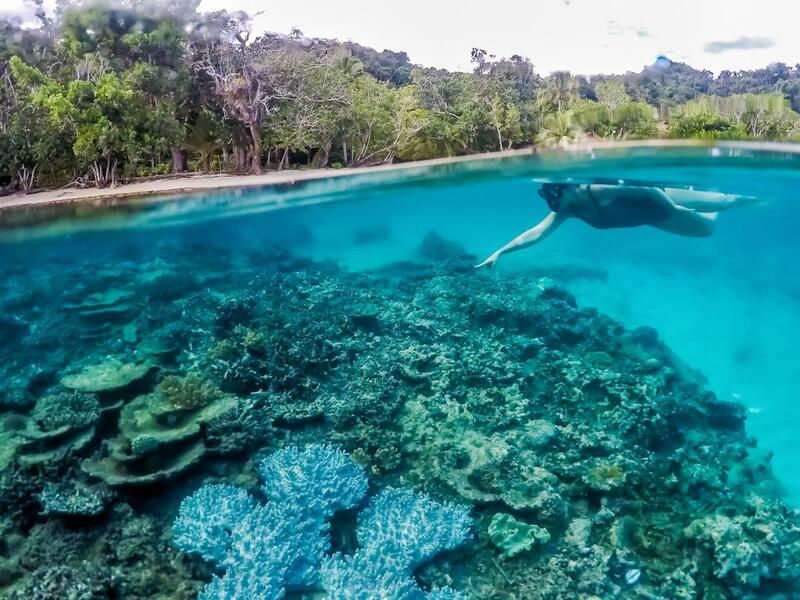 The Resort also offers charted dives to the White Wall and Rainbow Reef in the Somosomo Straights and also to Yellow wall another favourite dive site. 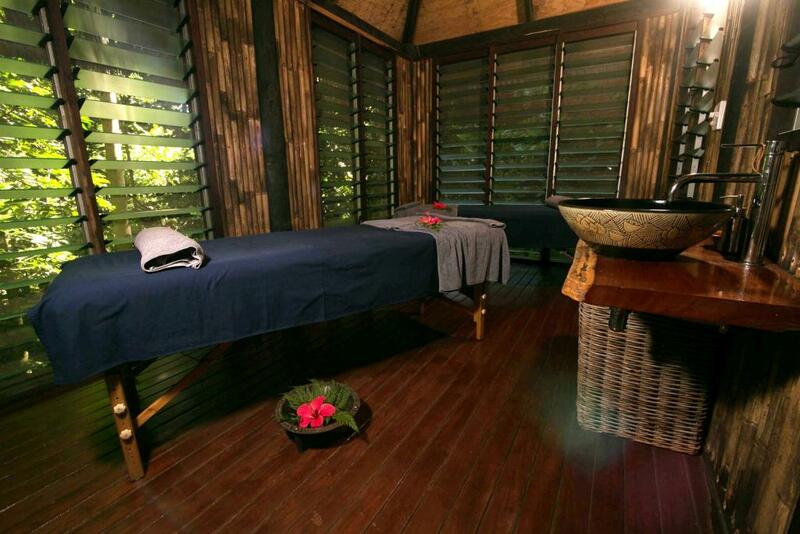 Qamea's award winning Jungle Spa is like no other, nestled on the edge of the jungle with five individual treatment bures, local Fijian and Guinot products are used to relax, rejuvenate and revitalize the mind body and soul. 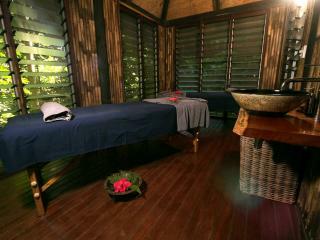 With sounds of the ocean and native jungle birds, unwind and indulge in the Jungle Spa experience Qamea has to offer. Treatments range from aromatic facials, spa treatmeants, body therapy, hot stones, massage, wraps, couples massage and spa packages. 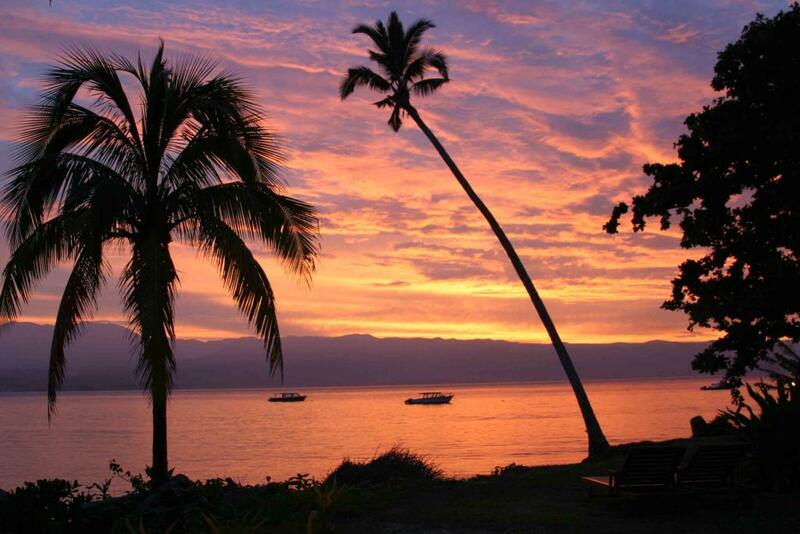 Qamea is the perfect spot to enjoy your special day. 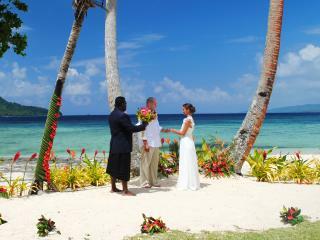 Exchange your vows on beautiful Qamea and enjoy the feeling of relaxed island wedding. 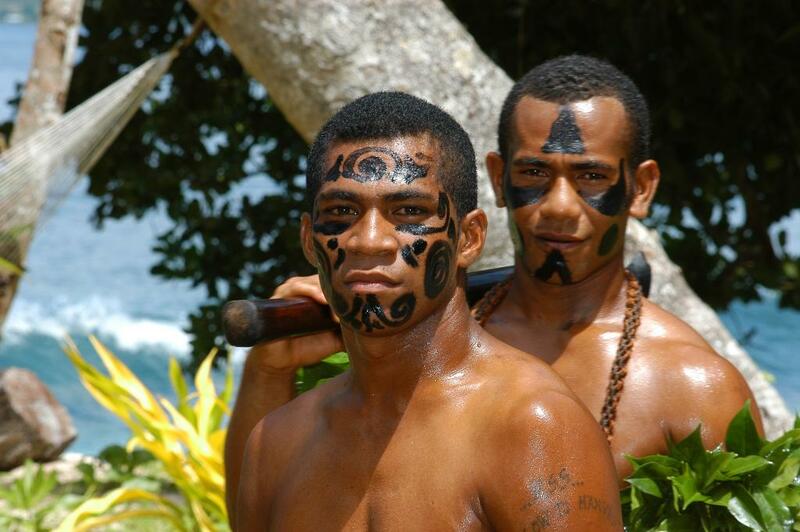 Wedding co-ordinators can cater for both couples that want their Fijian wedding to be a private affair or a full Fijian cultural experience. Please see the quote for Wedding Package inclusions. Upon arrival at Nadi Airport, transfer to Fiji Airways' Pacific Sun domestic airline for a short scenic flight to Taveuni Island. This flight transfer takes approximately 90 minutes and 40 minutes by car/boat ride to the resort. Children: Children 12 years of age and under are not accepted at this resort. Children 13 years and above are charged at adult rates.